This chapter provides detailed instructions on how to install and configure the HTTP Client service provider connection for SMS messaging using the Ozeki NG - SMS Gateway software. As you can read on the Service Provider Connections page, you need to install and configure one or more service provider connections for SMS messaging using Ozeki NG - SMS Gateway. One of the service provider connections supported by the software is the HTTP Client connection. The HTTP Client protocol can be used to connect your PC directly to the SMSC for sending SMS messages over the Internet. For each outgoing message an HTTP GET or HTTP POST request is used. Text and binary SMS message types are supported. To select the HTTP Client protocol, click the Install link in the respective entry in the list (Figure 1). When you have installed the HTTP Client protocol, the Configuration panel will show up on the right of the interface. The first tab of the panel is the HTTP settings tab, which consists of a Connection and an Identification section. In the Connection section, specify the HTTP Client settings. This information is provided by the SMS service provider when you subscribe to the service (Figure 2). $messagedata This denotes the first 1024 characters of the message text. $messageid This is the unique identifier string of the message. This identifier is generated by Ozeki NG - SMS Gateway. You can also determine the HTTP method: you can select GET or POST. Then, specify the telephone number assigned to this connection and the service provider connection name. To facilitate identification and to avoid confusion, you should name the connection after the GSM service provider. E.g., if you have set up an HTTP Client connection with Vodafone, it is advisable to name it "Vodafone". Also, note that different connections should be given different names. If you have different connections from the same service provider, you can use different but similar names for them, e.g. : "Vodafone1", "Vodafone2" (or something of the like). However, some load balancing solutions require an identical name for different connections. For details, visit the Load Balancing and the Load Balancing for SMPP v3.3 page. 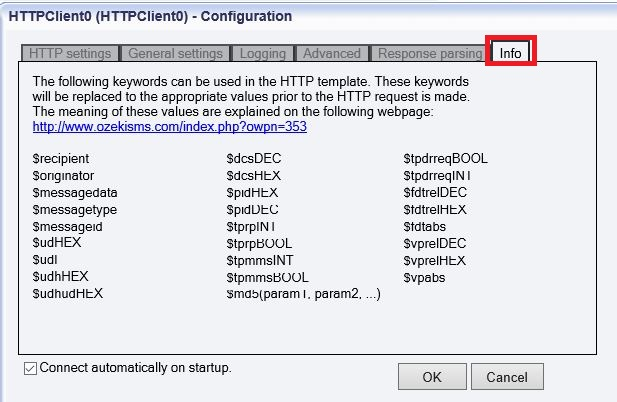 To perform general settings related to sending and receiving SMS messages using the HTTP Client connection, click the General Settings tab (Figure 3). In the upper section of the panel you can check either or both of the checkboxes. Which one(s) to check depends on what you wish to use this connection for. You can choose to use the connection for only sending or only receiving SMS messages (or both sending and receiving). Note that HTTP Client connections are mainly used for sending messages. However, it is possible to set up HTTP polling to download incoming messages from an HTTP server. In the Polling interval edit box you can specify the polling interval in seconds by entering a positive whole number in numerical format. If you are content with the default specification (2 seconds), leave this edit box unchanged. In the lower section of the tab you can make choices and specifications to handle your connection to the SMS Center and the status of your SMS messages. To configure logging, click the Logging tab in the Configuration panel. You can choose whether to make the program write log entries about sent and received messages in human readable format and/or log low level communication. Choosing the latter option will make the program produce logfiles containing binary codes representing the communication data. On Response parsing tab you can provide a keyword for response messages on successful delivery and keyword in response on failed delivery (Figure 5). By default a message delivery is considered successful if the HTTP server responds with an HTTP 200 OK. Some providers return HTTP 200 OK on all submissions and put the status code, that indicates delivery success into the HTTP message body. If this is the case, specify a keyword to search for in the message body. If there is no keyword that indicates successful delivery, you can specify a keyword that indicates failed delivery. If this keyword is specified, Ozeki NG will consider a message delivered to the network only if this keyword is not present in the HTTP message body returned by the HTTP server. The Info tab enlists the following keywords that can be used in the HTTP template. These keywords will be replaced to the appropriate values prior to the HTTP request is made. The meaning of these values are explained on the following webpage: http://www.ozekisms.com/index.php?owpn=353. To initiate the connection manually, click the Connect link in the panel of the service provider connection (Figure 7).